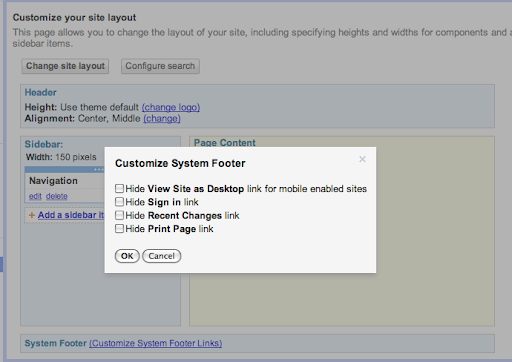 On the whatsnew.googleapps.com site, you’ll find instructions on how to access the latest designs for Gmail and Calendar. We’ll keep this site up-to-date with the latest information about the new look as well as a feedback form and other resources for Google Apps administrators and users. The Google team encounters fun and new ways of using the Google Earth and Maps API. Here’s an example of how a century old educational map and globe publishing company realized more students wanted to learn online and transformed their teaching methods to include a program built on the Google Earth API. Don Rescigno, from Herff Jones | Nystrom, explains how students and teachers benefit from technology in the classroom with StrataLogica. With today's technology enabling information to travel at a much more rapid rate than in the past, students feel more advanced than what many of us can remember from our own days in school. Elementary school students use a school computer, manage multiple usernames and passwords, work with spreadsheets, develop their own blogs and websites, and more. They’re tech savvy and they’re connected. The challenge for educators is to use tools and resources that take advantage of students' advanced technological skills. Combining educational content with technology like the Google Earth API gave us the opportunity to foster a new and immersive experience that changes the way students see our world. StrataLogica—combined with the Google Earth API —provides students with powerful tools to visualize and comprehend the ways in which geography has impacted events, politics and populations throughout human history. Students have the ability to see current events, taking place around the world, from their classroom. Using a computer or interactive whiteboard, students uncover layers of educational content and can then drill down to Google Earth’s satellite imagery, see what’s actually there, and even use historical imagery to compare then and now. Recently, I had to play the role of a teacher when one of my children overheard a CNN report on Japan and asked, “Dad, what made the earthquake and tsunami?” The ability to access and interact with so many resources—aerial imagery of the earthquake, videos, and photos posted by Japanese citizens, local news stories—allowed me to teach him about the Earth’s processes and their impact. It helped to create a better understanding beyond the news story. It fostered critical thinking and a global perspective. citizens. StrataLogica and the Google Earth API are helping change the way students see the world; they can “fly” to any location in a matter of seconds, zoom in to imagery and see street views of historical sites that they may never have an opportunity to visit, embed videos and photos, and experience their own virtual field trips. 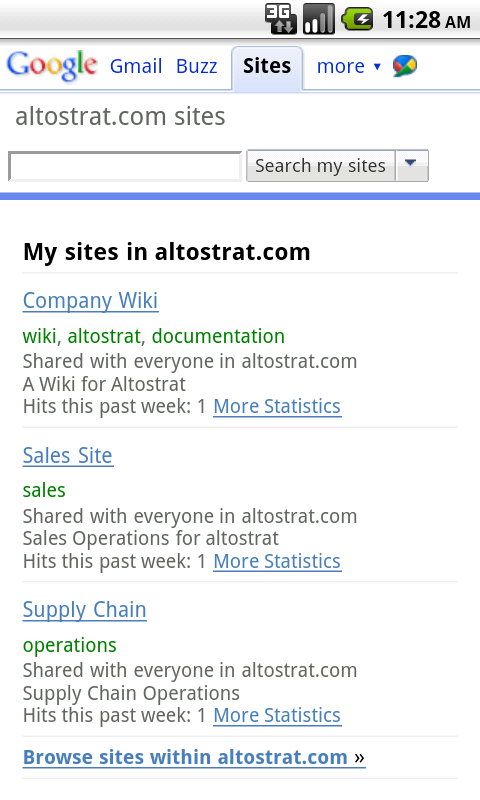 more, visit stratalogica.com to learn more. Editors note: Today’s guest blogger is Dan Moore, CIO for Quality Distribution (QDI), the largest tank truck operator in North America and a major transporter of hazardous materials. See what other organizations that have gone Google have to say. 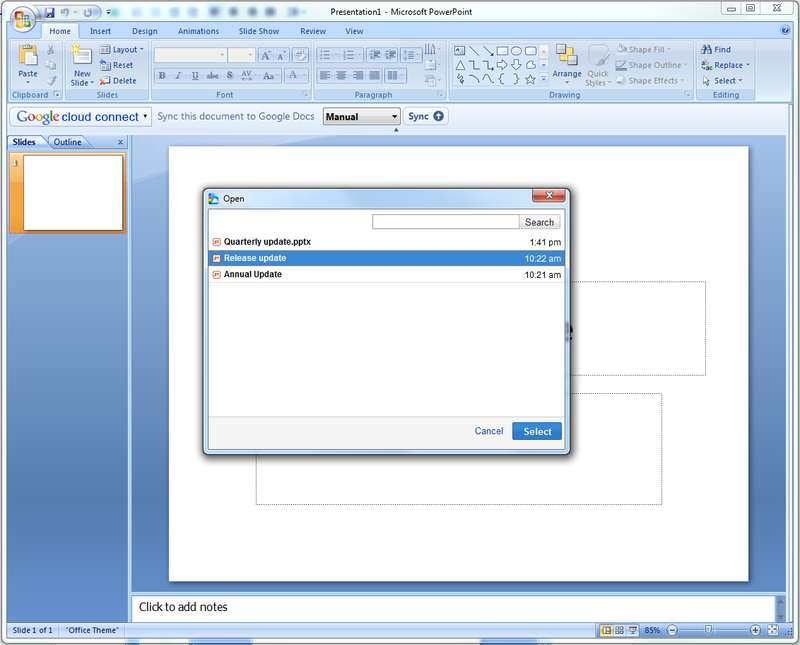 Prior to switching to Google Apps, QDI was a 100% Microsoft®-enabled shop. We heavily leveraged Microsoft Exchange Server 2007, Outlook, SharePoint Portal Server 2003, and all of the Microsoft Office suite. Like many companies in recent years, our budgets were tight, and our business requirements were not getting simpler. With approximately 1,000 administrative personnel and 2,500 drivers, and an aged desktop client base, we looked to cloud computing as a silver bullet. 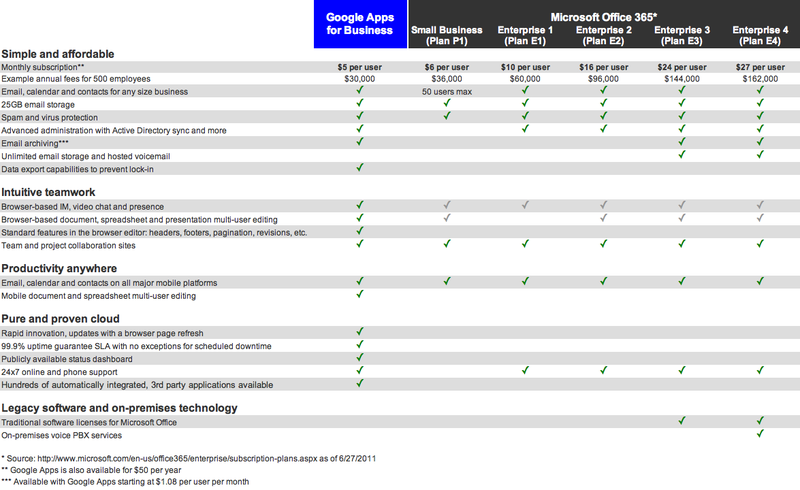 We compared both Google Apps and Microsoft Office 365 for several months in 2010. We decided to go with Google’s product line due to their simpler cost model, wider breadth of applications, and deeper experience at building applications for the cloud. Microsoft Office 365 did not seem as cohesive as the Google cloud offerings. The Microsoft total cost of ownership was higher, had more dependencies on the physical device, and fewer features. We rolled out Google Apps to our all of our corporate users over the course of a month, and we’ve already received positive feedback from employees. We anticipate saving $250,000 annually in software licensing, plus the cost avoidance of future spend on data center hardware. 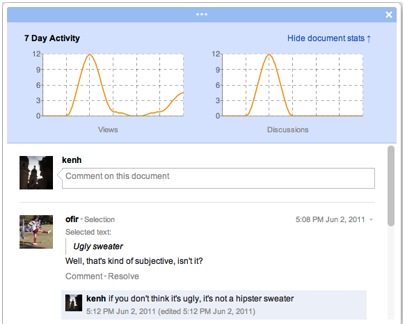 Perhaps more compelling, is the time savings opportunity of collaborating in Google Docs. We are already seeing early adopters embracing the collaboration of Google Apps, and I believe the time savings will only increase with the users experience. For the users that have migrated their documents to the cloud, we will be replacing their older PC’s with net-books such as Google’s Chromebook. The lower hardware requirements of web enabled applications, allow our IT department to spend more time delivering improvements to the the user experience. One of our first examples of this was our implementation of video and voice chat via Google Talk into our driver recruiting process. Finally, as Google Apps comes with access to the Google Apps Marketplace, our team has begun evaluating apps as solutions to business problems previously prohibitive due to expensive hardware and support costs. These apps are generally priced at levels with little risk to adoption while seamlessly integrating into the Google Apps enterprise. Our company still has a long way to go before I can say we are 100% cloud, but the trip so far has had few storms and many silver linings. Help us get to 365! Many of you have asked us to list all 365 reasons to consider Google Apps. We'd like to hear yours- add them here http://goo.gl/Az5Yb, and check back for the results later this week! If you’re interested in bringing Google Apps to your school, let us know. "It’s fantastic to have such support for public education from Google, an outstanding leader in the business and information systems world," says Wisconsin State Superintendent Tony Evers. "I’m glad we were able to dedicate resources to help schools take advantage of this opportunity. Schools need to save time and money, and students need to learn collaboration and technology skills so they will graduate ready for higher education and the workforce. " One of the reasons Wisconsin decided to bring Google Apps to the state was the overwhelming support from individual school districts. In fact, 81% of educators polled in an exploratory survey were already using or strongly considering Google Apps for Education. Many school districts who had gone Google offered to share their experiences to help the state make an informed decision. Jon Tanner, Technology Director of Oregon School District in southern Wisconsin, moved to Google Apps in 2007 and found that "by choosing Google Apps, the Oregon School District has saved tens of thousands of dollars, improved the reliability of our email systems, enabled easier collaboration for staff and students, and provided students with experience on the kinds of web-based, collaborative software that they will use in the workplace." 40 miles south, teachers in the Janesville School District have been using Google Apps for the past 2 years to create paperless classrooms. Franklin Middle School uses Google Sites to distribute the school's newspaper. Third grade teacher Nicole Andresen has gone paperless by relying on Gmail and Google Docs to distribute assignments. "I can create comprehension questions, surveys and other assignments for my students to answer from their email using Google Forms," she said, "and it's so much easier for me to grade since I don't need to remember to bring worksheets home." Kathy Boguszewski, Library Media & Instructional Technology Coordinator in Janesville, is excited for other Wisconsin schools to join the 12 million students and teachers that have gone Google worldwide. "Google Apps is changing how we work and teach," she said, "and we are loving it!" Editors note: Today Wyoming Governor Matt Mead is announcing the completion of the migration of all 10,000 state government employees to Google Apps for Government. State employees now have a unified communications system that makes it easier for them to find & collaborate with one another. View the live stream of the Governor’s announcement starting at 8:00am MT. Hello from the great State of Wyoming. We have some exciting news: our entire state government has gone Google. Wyoming is the first state in the country to make this transition. I am extremely proud to say that we are early adopters and this continues a long tradition of Wyoming firsts -- where Wyoming leads the way. Wyoming was the first state in the country where women voted. We also have the first National Park, Yellowstone, and first National Monument, Devils Tower. We had the first woman governor too. Join us online today at 8:00am MT/7:00am PT to view the live event as we make the announcement. Wyoming and Google finalized the agreement in October of last year and so in less than 9 months we have moved 10,000 state employees over to Google Apps for Government. This is a sign of the adaptability and flexibility of our state government -- another source of pride for us. My office was in the first wave to transition to Google Apps, and I am pleased to say it has already made a big difference. Among its many features, Google Apps has provided efficiencies for scheduling and for keeping the office running smoothly. Our pioneer spirit is alive and well, which means great things for the state of Wyoming! 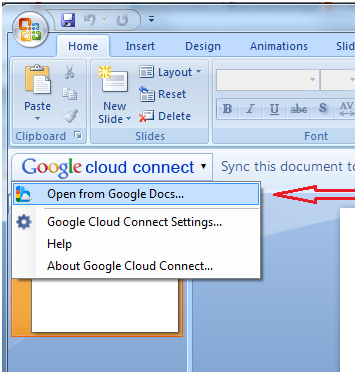 If you have a lot of files stored in Google Docs, use search to find the file you are looking for. After selecting a file to open, the file will be downloaded to your computer and opened automatically. As always, please send us your feedback and thoughts. Editors note: We're pleased to welcome guest blogger Terry Geiger, Director of Corporate IT at The McClatchy Company. Learn more about other organizations that have gone Google on our community map. With headquarters in Sacramento, Calif., The McClatchy Company has more than 8,400 employees with 30 daily newspapers spread throughout the U.S. Historically, each newspaper has operated independently with on-premise software and their own various business operation departments and specifically IT. To date, our technology has been both destandardized and decentralized, but our vision is to become a more collaborative organization and centralized where it makes best sense. We want to act as a cohesive enterprise, not a collection of smaller companies. We have 8,500 mailboxes (individual and shared) spread across all 30 of our operations. Individual newspapers had been operating using various versions of Microsoft® Exchange Server, and managing that complexity had become expensive and cumbersome. All of these separate systems also made it very challenging for us collaborate. Just seeing the calendar of a co-worker at another newspaper or having access to reliable contacts wasn’t possible in many cases. I knew that email was one of the first things we needed to standardize to promote collaboration and begin to innovate in an industry not always known for being on the cutting edge of technology. Also, email has become a business-critical function and with the economy and its impact on the newspaper industry, we had lost confidence in our ability to effectively manage and maintain such a distributed email environment with our diminished resources. We needed a solution that was easy to use and required little from IT to maintain. We started evaluating technology options that could help us make collaboration across our entire organization a reality. 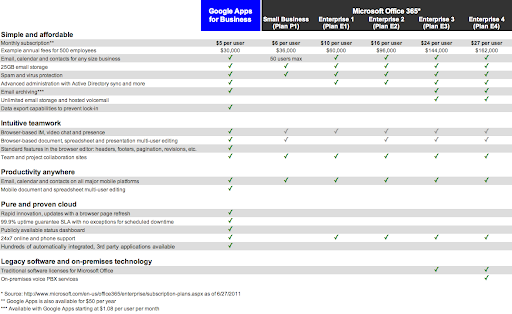 We looked at Google Apps as well as Microsoft® Office 365 and BPOS. When evaluating our options we asked ourselves several questions: What’s the service level offered? What is their support like? Will there be people there to help when we have questions or run into issues? What is their record for uptime and reliability? We just didn’t see Microsoft providing the services aspect of “software as as service.” Their record for uptime was particularly concerning. Overall, Microsoft just doesn’t seem to have the services mindset that we found with Google. Microsoft may still be the personal productivity leader, but Google is the team productivity leader. Google Apps and its collaborative nature are really where we want to go. Google has a better service strategy, better collaborative strategy, and a better cost structure. In making our decision, we also calculated the cost of avoiding upgrades to our Microsoft Exchange and Office licenses. We estimate that Google Apps will cost only 67% of what we would have spent on the equivalent Microsoft technology over 5 years. 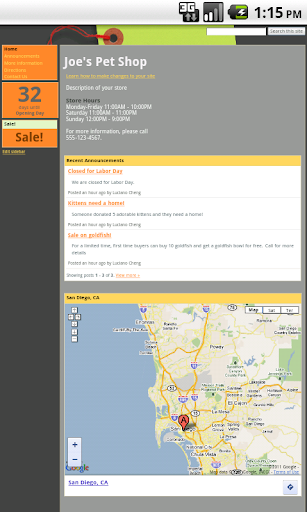 We’re currently working with SADA Systems to roll out Gmail, Google Calendar, Google Talk, and Google Sites. We’ll then let Google Docs take hold organically, but we are no longer going to en masse upgrade our Microsoft Office licenses. As a content creation and management company, the need to collaborate is tremendous and we’re excited about empowering our team to work together with Google Docs. 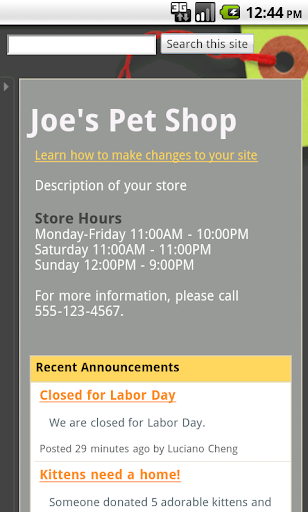 In addition to “anywhere access” email, we will now be able to synchronize calendars across the organization. 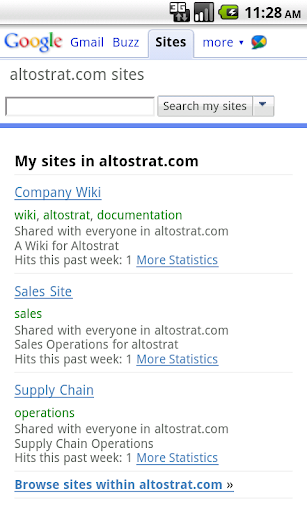 We have secure chat functionality, and Google Sites to create a much better connection between sales staff and customers. IT can focus on other business-critical functions that generate revenue, manage content creation and delivery and put collaboration and content creation into the hands of our users. We worried that there would be some resistance to this change, but our announcement to move to Google Apps has been met with a lot of enthusiasm – our employees are really excited. We see this as a critical part of our overall effort to use technical innovations like Google Apps to change the way that we operate our business. Editors note: California State University, Monterey Bay is a growing public institution that serves nearly 5,000 students. Today is the two year anniversary of CSU Monterey Bay’s deployment of Google Apps. Guest blogger Greg Pool, Lead for Web Services, shares CSU Monterey Bay’s experiences with opting into the new infrastructure for Google Apps early. CSU Monterey Bay (CSUMB) considers itself a “pre-release” campus; we want the latest features. 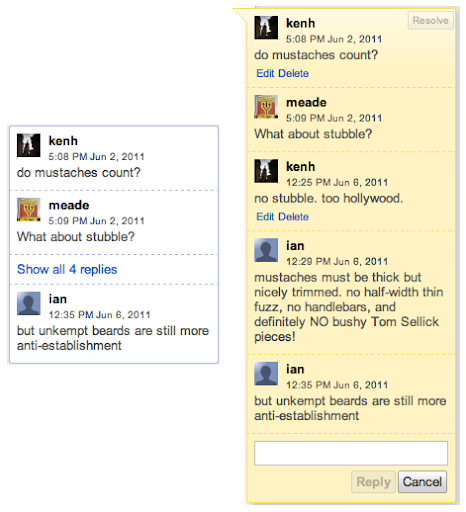 This isn't to prove "we're cool," but because we see an opportunity to meet our users’ needs. When we heard that Google was making more applications available to Google Apps users, we were excited because services such as Blogger fit with a number of internal initiatives we had planned for this school year. In our view, the transition to the new infrastructure represented an opportunity to get access to tools we wanted -- for less money and in a more integrated manner. Our IT department supports 10,000 users representing distinct groups and needs (faculty, students, staff), so we decided to take the timeline into our own hands. To minimize disruption for our users we planned the transition to the new infrastructure around our academic calendar. We also chose to transition a pilot group of users from our IT staff before flipping the switch for everyone, which helped us understand exactly what our users would experience during the transition. One issue we had to address before the full transition was conflicting accounts, which occur when a user links a personal Google account to their CSUMB email address. Using the transition wizard, we were able to reach out to the 500 conflicting accounts in our organization to educate them about the change. In the end, only one of these 500 users wanted us to walk through the changes with him personally. In early January we were ready to switch all of our users over. Everyone in our IT department is a "glutton for punishment," meaning we love to test new technology, poke around looking for bugs, and run through every possible scenario where a user might encounter a problem. With this project, our gluttony for punishment wasn’t satiated: we didn’t run into a single significant issue while testing. The transition turned out to be a total non-issue. It just worked. And it has continued to work. After the transition our help desk support volume didn’t increase at all, even though we’ve enabled almost all of the new services, including Blogger, Google Moderator and Google Reader. Now all of CSUMB’s users can do the educational work with Google Apps that some were doing with their personal Google Accounts before. All that cool academic stuff can now be done in one place, and everyone has access to the same set of tools. 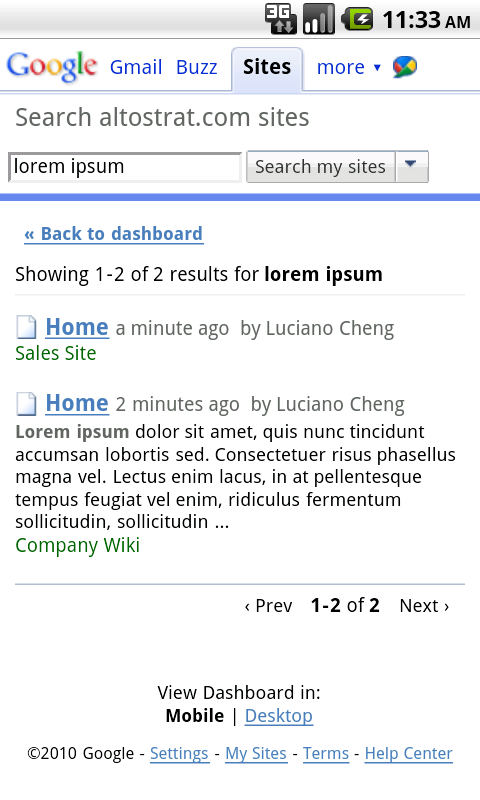 We’re excited about the ways these new applications increase our users’ potential. 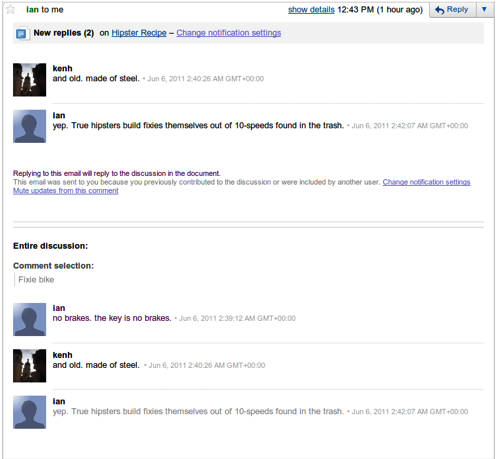 For example, one of the applications that has seen a lot of use is Google Moderator. This tool allows students to ask questions, show due diligence, and participate in campus discussions, even if they aren’t physically present in the same place. When we made the decision to enable the new applications, some of them such as Google Moderator had clear uses for our users, but we are convinced that students and faculty will find creative ways to use these services that we never could have thought of. We are still early in our exploration of what we can do with all of these new tools and we're looking forward to tons of new possibilities. These three updates are available to both Gmail and Google Apps email accounts. A few weeks ago at Google I/O we announced a new kind of computer: Chromebooks. Chromebooks are fast, secure and simple to manage. Users like the easy, instant access to all of their computing needs without the complexity of traditional PCs. And if you’re a business or school, they’re extremely cost-effective. With today’s announcement that the new Google Chromebooks are available from our partners, we’re officially open for business. For businesses and schools, we’re offering a subscription that includes the Chromebook, a web-based management console and 24/7 support from Google starting at $28 per month/user for businesses and $20 per month/student for schools. Pilot customer Jason's Deli discusses Chromebooks. This month we’re adding Staff Picks to our monthly App Tuesday posts to better help businesses identify and try great applications from the Google Apps Marketplace. With our inventory growing to well over 300 applications, these efforts help bring to the forefront new and interesting applications for your business. Our vision for 100% web is to provide a seamless workflow with our apps and the best apps on the web. Whether you need project management solutions, finance tools or a database for your customer interactions, with Marketplace apps you can benefit from convenient integrations such as single sign-on, Gmail integration and Calendar and Docs synchronization. Instead of managing on-premise solutions for your everyday business needs and dealing with constant software updates, patches and access issues, try running your business through Google Apps and the Google Apps Marketplace. The National Oceanic and Atmospheric Administration (NOAA) has selected Google Apps as the agency-wide e-mail and collaboration platform for its 25,000 employees, contractors and associates working across the country and around the world. NOAA CIO Joseph Klimavicz made this announcement at “Innovation for the Nation” today in Washington, DC. As an agency that enriches life through science, NOAA's work stretches from the surface of the sun to the depths of the ocean—and touches the lives of every American and many others around the globe each day. NOAA provides dependable weather forecasts, life-saving storm warnings, vital climate monitoring, sustainable fisheries management, safer navigation, protection for our fragile oceans and coasts and job-creating coastal restoration. Now the NOAA workforce will have cutting-edge email and collaboration tools to keep pace with fast-accelerating environmental change. Planners, emergency managers, health officials, citizens and other decision-makers count on NOAA's internationally-recognized science and services to help make wiser choices in a changing world. When the need for a modern email system arose, NOAA issued an RFP in January, in keeping with the Obama Administration’s “Cloud First” policy, to find cloud-based email and collaboration solutions that would best serve the agency’s needs, including meeting its stringent security requirements. Since NOAA wants its highly distributed workforce to enhance sharing information and strengthening teamwork as soon as possible, speed and ease of deployment were key factors in the decision to select Google and our implementation partners ERT Inc., Unisys, and Tempus Nova. By the end of the year, NOAA's workforce will migrate to Google Apps from its existing systems, giving employees tools like video chat and real-time document collaboration, and support for a broader range of mobile devices. NOAA is also promoting new telework options; Google Apps will enable staff to access their e-mail, documents and data from anywhere, on any internet-connected device—a valuable asset for the agency. As a cutting-edge science agency, NOAA is taking a leading role in bringing up-to-the-minute workplace technologies to the federal government. Editor's note: Today over 100 government IT leaders are gathering in Washington D.C. for “Innovation for the Nation,” the inaugural government leadership forum hosted by Google. At this event we announced six government agencies that have recently chosen Google Apps for better innovation and collaboration while reducing costs. Resellers are one of the key drivers of customer adoption of Google Apps, Earth, Maps, and Enterprise Search. Over the last few years, the Google Reseller Program has grown to include over 3,000 resellers across 70 countries. We are excited to see our partners share our commitment to customer success. We will continue investing in our Reseller Program to ensure that all of our partners have the support and technical expertise they need to enable successful customer deployments. Beginning today, we will start to recognize high-performing partners as Premier Resellers. Authorized Resellers remain a core focus for our Reseller program, and we will continue to invest in resources, tools and training to help Authorized Resellers succeed. For Authorized Resellers to become Premier Resellers, we have an objective set of eligibility criteria based on revenue, technical expertise and customer success. We are committed to working with each of our resellers to help them meet these specific qualifications. We're also introducing additional categorizations to help customers identify resellers who focus on specific Google products and specific size companies. As our reseller partners continue to help customers succeed, we hope these new standards will help them strengthen their business by providing clear benchmarks for them to strive for and meet. Current and prospective Google Resellers can learn more about the different categories and about becoming a Premier Reseller, including eligibility criteria and benefits, by visiting our Google Reseller Program website. As a business person, you probably share the frustration of struggling to gain access to corporate tools and portals that are essential to your job. This can be as simple as a budgeting tool your predecessor forgot to extend your ownership privileges to, login details for a corporate microblogging account, or maybe even the control panel you need to access to customize your website search engine. We'll be the first to admit that ownership transfer historically hasn’t been easy with Google Site Search (GSS). In fact, we used to require GSS owners to completely recreate their search engine in order to assign a new owner. Thankfully, we've just announced major simplifications to this process. Adding a new owner is now as simple as clicking a button and adding your new owners contact details - quick and easy as it should be. Read our custom search post for more details. Editor's Note: We're pleased to welcome guest blogger Laurent Bortoluzzi, CIO of LXR. Headquartered in Boca Raton, Florida, LXR is a collection of hotels and resorts across the United States and the Caribbean. LXR joins other hotels like IHG and Delta Hotels that are already using Google Apps. Learn more about other organizations that have gone Google on our community map. At LXR we’re committed to service and continually look for ways to enhance the comfort and enjoyment of our guests. Our 7,000 talented and hard-working employees make the difference in providing a great experience at our 20 resorts and hotels. As CIO, it’s important to me that I provide the LXR team with the best tools to optimize the way they work and ultimately provide excellent hospitality. 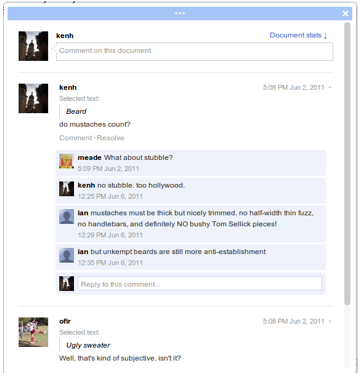 We recently decided that one of the ways we could do this was to move to Google Apps. With the help of Google Apps Reseller, Cloud Sherpas, we’re migrating 3,000 mailboxes to Google Apps. We’ve deployed four hotel properties as well as our sales and marketing teams and everything has gone smoothly. Based on the surveys we sent out to employees following the deployment, they’re extremely happy with Gmail and are already starting to use Google Docs. Notably, there was no negative feedback, and in fact, a majority (75 percent) of employees said they’re glad we switched to Google Apps. Our marketing department is particularly excited about using Google Sites to share creative files. They’ve found Sites so intuitive that they don’t need any help from the IT team to set up new project sites. I also think our employees will see tremendous benefits from the ability to collaborate on documents instead of sending emails with attachments back and forth. It’s been amazing to see how many features have been added to Google Docs and how much the product has evolved since we first started evaluating Google Apps last year. Google Docs will prevent us from having to upgrade licences for most of our employees. Our HR department is excited about video chat with Google Talk. We typically fly recruits to Florida for interviews, but by using Google Talk’s video chat for initial interviews, we’ll not only save money on travel costs, but also the time it takes to arrange several rounds of interview travel. I’ve also started looking at the Google Apps Marketplace. There are so many applications that we can use, from work flow to expense report applications. Processes that are pretty cumbersome today could get an overhaul with applications that will integrate seamlessly with Google Apps. Since Google Apps is web-based, our employees can get their information from any device, wherever they are and the IT team can spend less time managing software updates on company supplied laptops and Blackberries. Access to real time information is extremely important in the hospitality industry. 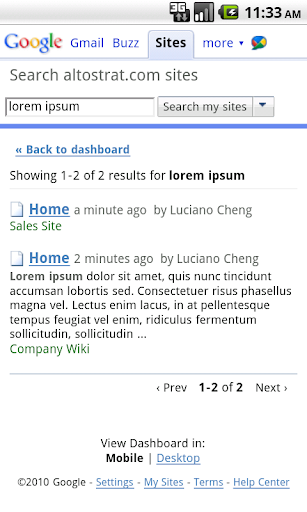 The way we see it at LXR, the web is the future. Google Apps allows us to focus on business-critical projects that increase revenue and save costs, while making both our employees and our executive team happy.